At Alternative Earthcare, we understand that you are doing a lot more than maintaining grass, trees and shrubs at your properties. You are involved in maintaining memories for your customers. 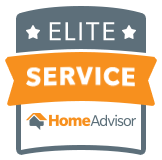 So our professionals understand that it takes time and sensitive care to maintain your property. We also know that in providing this care for your property it can be a very demanding job, and we recognize the role that a healthy, well-groomed lawn plays in helping you market and manage your property. 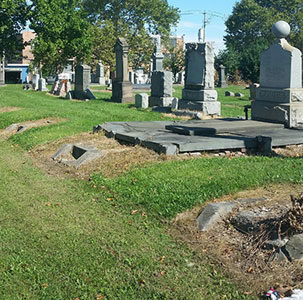 Alternative Earthcare services Condominiums, Apartment Complexes, Industrial Properties, Cemeteries and Large Scale Communities. 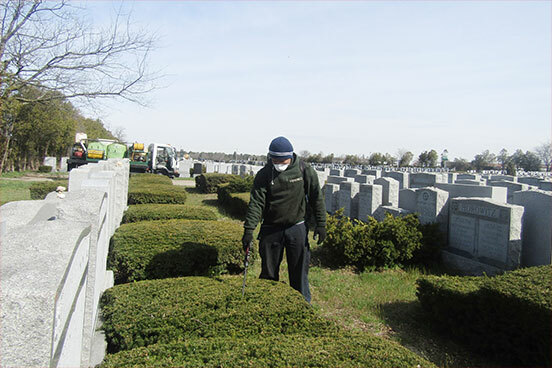 We service, but not limited too all of : Nassau, Suffolk, Brooklyn and Queens Counties. 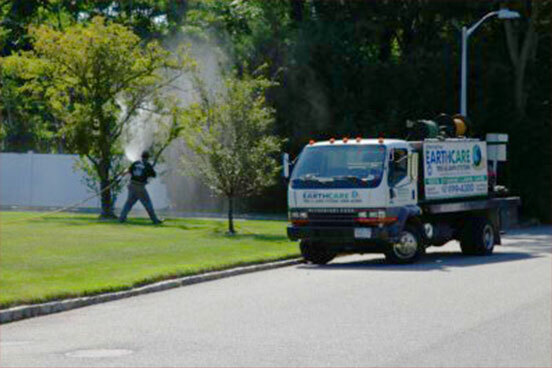 Long Island’s Commercial Lawn Care, Tree Service and Insect Control Company! We utilize both granular and liquid fertilizers, with our liquid formulations , we custom blend the proper nutrients to meet your properties needs and help them look their best. Alternative Earthcare will have soil samples from your grounds tested to determine a starting base which we will build off of. We will then adjust the nitrogen, potassium and sulphur according to the results of the test. Whether you are looking for a deep green color and minimum top growth or good color and dense turf turf we can achieve those results. We have been testing with great results an environmentally safe fertilizer that will not leach into the ground water. Once applied in the spring, without a surge in growth the fertilizer will slowly spoon feed the turf for up to 6 months. There is no one selective weed control product that will eliminate all weeds, not non selective but controls that only target weeds. Alternative Earthcare will target the weeds that are the highest percentage in your turf ie; Clover, Dandelions, Henbit and Mumweed. We will apply the least toxic, lowest odor products available to us and apply according to the label recommendations. Harder to control weeds sometimes need to treatments to totally control them such as violets, we will spot spray your property especially in sensitive areas when possible. 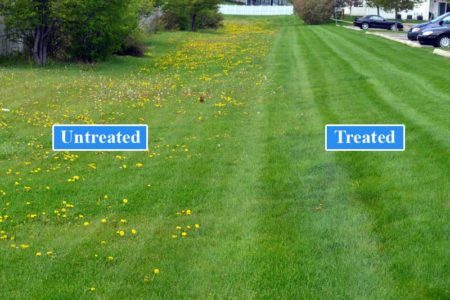 Grassy weeds such as Nutsedge, Crabgrass and Foxtail are harder to control; a second treatment will be needed to totally eradicate these undesirable grasses. When treating these weeds we spot treat and add a sticking and penetrating agent that will help us to achieve positive results. Fungus and diseses are brought on by environmental and weather conditions. 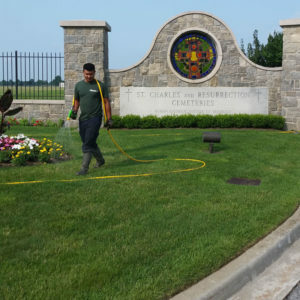 Where we cannot control the weather such as high humid temperatures and drought, we can control our cultural practices like watering and mowing. This will help along with seeding for the more resistent varieties of seed (turf type tall fescue). Fungicides can help before the disease gets down to the crown and root system and eventually killing the the turf plant . Their are no guarantees with fungicides because we cannot control mother nature and the products are very costly. 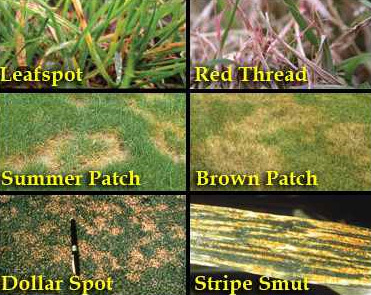 We do monitor your turf for these diseases, because some disease thrive on nitrogen such as leaf spot. Over fertilizing will only worsen the situation. In the spring there is a fungus called Redthread which produces small patches in the turf and the tip of the grass plant looks like red sowing thread. Most lawn care companies will ether apply nitrogen or a fungicide as this fungus is brought on by iron deficiency and that is why we add iron to our late spring treatment. 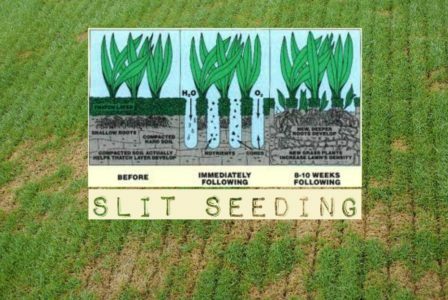 The root zone of the grass plant needs water and air to remain healthy, there are a few factors which will lead to heavy compaction in the soil. Heavy machinery, excessive foot traffic and extended drought are all contributing factors in making the soil hard like cement. The Aerification Process is essential in bringing turf back to its healthy and thick form.The process will take cores of soil from the ground which will allow the soil to breathe, then we will over seed with a summer stress blend of grass which is more drought resistant. When there are larger areas of turf that need to be renovated or need to be thickened to help recover from stress or to help fight off undesirable weeds and grasses. While making rows of lines in the soil the seeder will drop a good amount of seed into these rows followed by a brush which will cover the seeds. Vegetation that grows wild on bare land, graded lots and commercial properties can be a potential breeding ground for pests. Proper weed control can help protect your property value, preserve your relationship with the community. 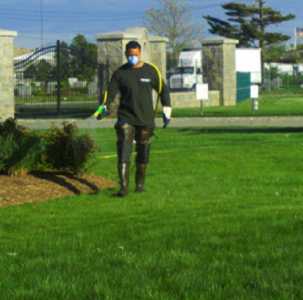 Weed prevention in bare dirt or gravel areas, on walkways, in parking lots and throughout planted landscapes. Applications prior to paving to prevent weed breakthrough in asphalt paving. Selective grassy weed control in established planting areas. 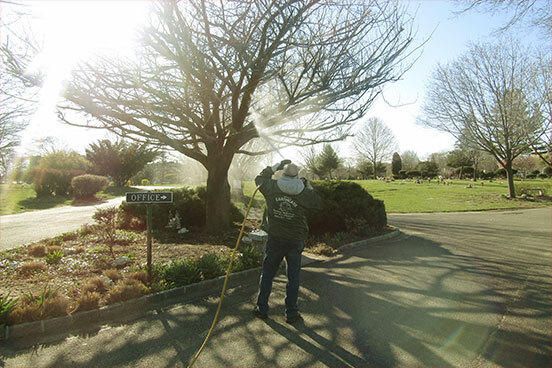 Weed control in bare areas and in cracks and crevices in and around load-bearing surfaces. Long-term weed suppression in industrial areas. Combined pre-emergence and post-emergence applications. Pre-emergence applications to established plantings to prevent weed germination. We monitor your property each visit and will treat the affected plants with a broad spectrum product to help minimize damage . We will apply the right product at the correct time and at the correct rates according to the label. For harder to control insects, such as scale we will soil soak around the base of the plant. For insects that bore into the bark of birch and beech trees Alternative Earthcare will inject the tree with treatments into the base of the tree to help extend the life of the tree. 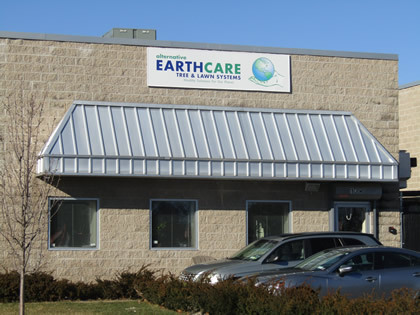 Alternative Earthcare uses an integrated approach to managing insects and diseases that begins with maintaining plant health using alternative practices which include soil sampling and creation of plans to make for optimal soil conditions for plant growth. Periodic inspections are essential to detect pest infestations before they reach damaging levels. Both Soft Shell and Armored Scale are difficult to control. Soft shell scale excrete honey dew that will create a fungus called sooty mold which will interfere with photosynthesis within the plan. 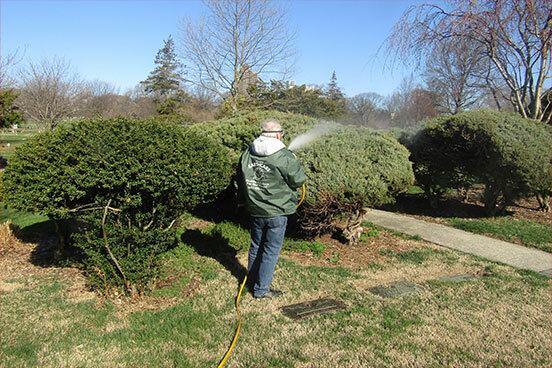 We treat this mold with dormant oils in the spring and a contact and systemic soil soak will help the plants get rid of these damaging insects. Dormant oils are effective in controlling certain scales that overwinter as nymphs or adults such as Cottony Maple, Euonymus, Lecanium, and Obscure Scale. We at Alternative Earthcare apply such oils in early spring and late summer to eradicate insects by killing them while they are still in the egg part of the cycle. 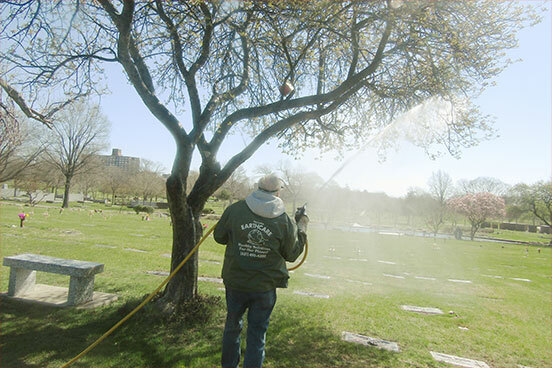 Deep Root Fertilization is a process where a Alternative Earthcare technician injects our specially blended fertilizer directly into the root zone of your trees and shrubs. Our timed release fertilizer formula continuously feeds and nourishes your landscape throughout the entire growing season to give you the healthiest and vibrant landscape possible. Alternative Earthcare’s balanced deep root fertilizer blend includes precise amounts of premium slow-release nitrogen, phosphorous, potassium, iron, and a micronutrient package along with beneficial Humic Acid all designed to significantly enhance the health and beauty of your valuable landscape all season long. We root feed in both the spring and the fall of each year.